The U.S. Fish and Wildlife Service (USFWS) has confirmed that White-nose Syndrome, the devastating disease that has killed millions of North American bats, has been confirmed in the United States federally endangered gray bat. The gray bat inhabits a limited geographic range in limestone karst areas of the Southeastern United States and was put on the endangered species list in 1976. 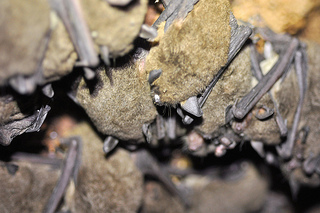 They had since been making a strong recovery due to conservation measures such as restricting human access to Gray bat hibernation and roosting sites. Considering that this species of bat lives in caves year-round and exist in large numbers in only a few caves, they are very vulnerable to disease and disturbance.